Today I said farewell to Annika, who flew back to Germany today. It felt a bit strange to sit in my car alone again after leaving her at the Kiruna Airport. The weather was as dull as many days this winter: Again it was quite windy, a grey layer of clouds covered the whole sky and with ± 0 degrees it was warm again. What a lousy winter we have this year! After leaving Kiruna Airport I headed to Karesuando, where I planned to spend the night. I tried to get a room in the hostel, but I was told, that it’s closed and there was not a single accommodation on the Swedish side (Karesuando). I was also told that there’s a hotel on the Finish side (Kaaresuvanto). 10 minutes later I asked for a room in this hotel, but since the only available room should costed 250 Euros (!) for a single night, I preferred to continue my journey. Visiting Karesuando seems to be a bad idea in winter time. I followed the river Muonioälven, turned left in Palojoensuu and left again in Enontekiö. In Palojärvi, just 10 km before the Finnish-Norwegian border I saw a sign showing a shop, a restaurant and rooms for rent. First I was not too hopeful, because many rooms, camping places and cabins are closed over the winter, but I was lucky. I did not only get a real fine hamburger, but a whole cabin for 36 Euros, just a seventh of the hotel room. And the cabin is nice, cozy and warm, only WiFi is lacking. I’m sitting at my computer, writing this blog article while many storm gusts howl round my little wooden house. Tomorrow I want to continue to Norway: First Kautokeino, then Alta. The first fjord since some a whole month. … when I came across a huge flock of resting birds that turned out to be Purple Sandpipers. Cautiously I changed the lens and tried to get nearer, nearer, nearer. The birds got a bit nervous but didn’t fly away. But suddenly – I didn’t move at all – the whole flock arose into the air, wheeled over the sea in a large circle, divided into two minor flocks and one of them came back to the place where I stood landing just some metres in front of me. Just great! To make it short: Yesterday evening I arrived in Kirkenes, that’s almost 600 km from Honningsvåg, where I started after breakfast. And 600 km in Norway is quite a long distance. I took the E69 to Olderfjord and the E6 to Karasjok. I wasn’t in the mood to have a closer look at this little town so I just continued. The 92 to Finnland and the 970 along the winding river Tenojoki. The sun went down and I became hungry. I found a little pizzeria and was glad, but it was already closed since 18:00 Finnish time which is 17:00 middle european time. Bad luck! To get something to eat – this part of Finnland is quite uninhabited – I bought a chicken wing in the grocery nearby. I continued the trip and crossed the border once more, being in Norway again. I stopped at a house that had rooms to rent. Would it be open in winter? Yes – but the room in the quite smelly and ugly house costed 850 NOK, that’s 99 Euro! I refused and continued my trip. After driving many, many hours I was hungry and tired. On a parking place in the middle of nowhere – meanwhile it was pitch dark – I nibbled my chicken wing and went on. I planned to visit a friend in Kirkenes but didn’t succeed to contact her yet. Anyway I would continue the journey to Kirkenes the same day and perhaps sleep in the car until I could contact the friend. That’s where my mood went down a bit – just a half cold chicken wing for dinner and sleeping in the car without any company. Finally I arrived in Kirkenes, but I lacked the current phone number of my friend. At least the internet revealed the postal address. Finally I found the house – a flat-sharing community – but nobody seemed to be there. But I was lucky: Just before I entered my car again a woman left the house and helped me to contact my friend, who was staying at another place for some days. I took the car and 15 minutes later I arrived. Great! Now I didn’t only had a warm place to sleep but also company which I was very thankful for, because travelling alone is a bore sometimes. Good travelling is having a cozy place to sleep, good company, enough food, internet for blogging and every now and then a hot shower. What a beautiful morning! -6 °C and blue sky. I was accommodated near the Kirkenes Snow Hotel where my friend I’m staying with works. I had a look into the Snow Hotel first, It has an impressive lobby with tables and a bar and round about 20 rooms where tourists can stay over night. After looking around I drove into the centre of Kirkenes and had a walk at the port. First I discovered the commercial fishing part: Big piles of traps for the big King crabs and fisher boats lettered with latin and cyrillic letters. But not far away you could see the touristic part: The Hurtigruten ship Kong Harald that landed nearby. I walked at the shore a bit and tried to make photos of the big ice floes that lay ashore but clouds had approached and the light was a bit dull. So I took the car and took the road E105 to Му́рманск (Murmansk). No, I didn’t plan to travel to Russia but I wanted at least to see the Russian border. It’s not far away and soon I parked my car just in front of the border. I’m child of the cold war. It was great to see, that there is a normal border now (even if you need a visa for travelling to Russia) and that you are allowed to take pictures. On the other side this border seemed to be more the “end of the world” to me than the North Cape. On the right-hand side there is the lake that is marked with orange warning signs. This is part of the Norwegian–Russian border that crosses this lake. You shouldn’t set foot on the lake, but at least I went to the shore to take a picture of the Russian custom. It already started snowing on the way to the Russian border but on the way back the snow fall intensified. It was still easy to follow the road but hills that very a bit farer away where hardly visible. Back at the snow hotel it was still snowing a lot and quite windy but warm as well: +1 to +2 degrees. Some of the 140 huskies were still out on tour while the rest of the dogs could take it easy. Yesterday I was on one of the tours, that the Kirkenes Snow Hotel has in its program: King crab fishing. These huge crabs are caught in big crab traps. First we were provided with scooter overalls, big leather mittens and helmets, because we were driven to the place by snow mobile. The crab trap of the snow hotel is located at the end of the Langfjorden. Normally it would be necessary to free the hole from new ice but yesterday it was too warm and the trap, that looks like a big cage, could be pulled up directly. And yes – we were lucky – a lot of king crabs were in the trap. Bry, the guide, took four of them and showed them to us. There are fascinating animals and looking at them closer they look like aliens. Gry killed them with a knife and they’re dead in a split of a second. Then she took the legs, that’s the eatable parts and threw back the rests that instantly were eaten by cods swimming around. We took the snow mobile to the restaurant, Gry driving, me sitting behind her and the other seven tourists in the trailer. There’s an outside kitchen where the crab lags are steamed for 16 minutes. They look red after steaming. They’re eaten with white bread, butter, lemon and mayonnaise and they taste extremely delicious. I ate lobster twice in my life and many other types of crabs and crayfish but I liked king crabs best. And there’s a lot of meat in the legs. Three legs were more than sufficient to be full, I ate four and really was stuffed. Delicious! I no can speak english anymore 2day. I do did travel far 2day. Kirkenes round half past 8, Skelleftehamn 22:22. That’s – I cannot calculate neither anymore – that’s many miles. Tomorrow after big, big sleep I try to write something meaningful again. My journey took 55 days – I have still some weeks holiday left but decided to shorten the trip. In this 55 days I visited Solberget, Abisko, the Vesterålen, Tromsø, Murjek, Loma Vietonen in Finland, Björkliden, Nikkaluokta, Alta, Honningsvåg, the North Cape, Kirkenes and many other places. I slept in my tent only 3 times, had 16 free overnight stays and payed 36 times between 23 and 69 Euros. I travelled 6630 kilometres by car, which consumed 563.5 litres of fuel (if I wrote it down correctly). The longest distance on one day was the journey back home from the Kirkenes Snow Hotel that took 856.5 kilometres. 563.5 litres were burnt to circa 1300 kg CO₂. That’s the same impact as flying from Bremen (my home town) to Tenerife and back again. It’s hard to calculate how much the journey costed. Shell I include food that I need at home, too? The new battery for the car? Anyway the journey costed round 3200 Euros, including the daily food, excluding the car battery and some equipment I bought. The winter this year was extremely warm. Therefore the lowest temperature on the journey was a mere -24 °C. The lowest temperature while tenting was -22 °C. There were at least 20 days with temperatures above zero. The largest amount of snow I should guess was 150 cm since it was shoulder deep. Mostly the snow in Sweden was between 70 and 100 cm, in Norway a bit less and later on the journey less as well due to the high temperatures. The temperature minimum home in Skelleftehamn was -16 °C. The last years it was less than -20 °C several time each winter. I’ve been home again for some days. The weather in Skelleftehamn is between winter and spring. The sky is clear and the nights are cool (last night for example -7 °C) but as sun the sun comes out the temperatures rise soon to degrees above zero. Parts of the ground are covered with hard snow – in my backyard i measured 45 cm – but other parts are completely free of snow and I’m waiting for the first flowers to come out and blossom. The Baltic sea is mostly free of ice, but near the shore and in some sheltered harbours there is still a thick layer of ice covering the water. And since the night was quite cold, parts of the near harbour that was completely open yesterday was covered with thin new ice this morning. I could walk over the ice to some islands that still are connected to the mainland or I could take the kayak and paddle to some islands, too. But to be honest – I’m quite lazy after the long journey and I guess I stay home today and take it easy. “4:45” showed the clock when I woke up this sunday. Seventy minutes later I stood at the shore – just on time to see the sunrise. My kayak still was fixed on its cart with paddle, camera and dry suit inside. I put on the dry suit, pushed the kayak into the water and started the tour. When I left home it was -6 °C and parts of the sea where covered with thin new ice. Thin enough to melt under the day but thick enough to give me a hard time to break through with the kayak. I’m always a bit nervous when I stick my paddle into the ice. Will it break one day? But until now it went well. Sometimes it was easier to take the hand and pull the kayak ahead. And sometimes, when the ice got really thick I used the paddle to hack small holes into the ice that I used as handles for pulling me forward. But after a time I reached open water and paddled along some old ice floes that were much, much thicker. And a bit later I came to the huge icy surface, that lays between the mainland and the islands Norrskär and Bredskär. I got out and stepped onto the ice. I think, this is the first time that I stepped onto the sea ice from my kayak. I wasn’t nervous, first of all is this old ice really thick, I should guess at least 30 centimetres, probably more. Then I always wear my completely waterproof immersion suit when I make a kayak trip in winter. After a short break I continued the tour and headed to the island Gåsören. On the outer shore there were some impressive ice floes left. It took a while until I could go ashore, because I had to cross another field of new ice. I took a longer rest and took of the dry suit. Ugh! Like always I sweated in the thick neoprene suit and now I smelled like a dead Puma. I took on some other clothes and first it was quite chilly. The spring sun however had enough power to warm me up and soon I took of my gloves and cap. Most snow has melted and beside of the ice covered rocks at the eastern bank Gåsören almost looked like spring was here. After a while I dressed for paddling again, entered the kayak and returned to the starting place. With the last ice behind I had a beautiful view of the islands Klubben, Flottgrundet, Gråsidan and Nygrundet. With the blue sky and the blue sea I had the feeling of leaving the winter behind me and paddle into the spring. When I was home again the thermometer showed +7.3 °C. Almost spring! Let’s make it short: I feel betrayed by the winter this year! It was too windy and it was too warm! Much too warm. And when it snowed, I was far away. 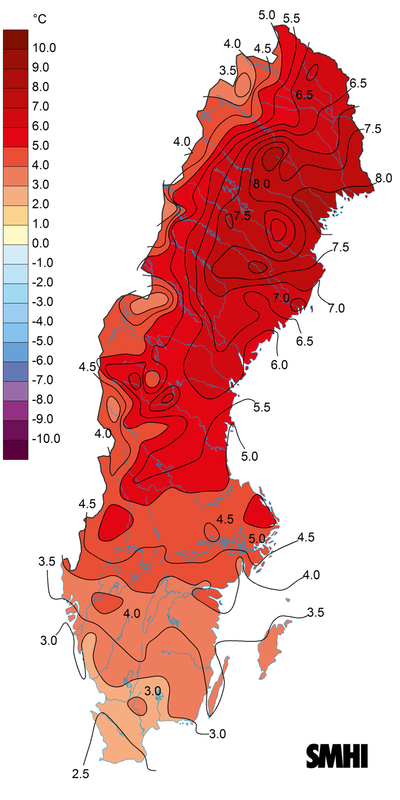 First of all it was too warm – the average temperature of the whole February was 8 °C too high in parts of central Swedish Lapland. That’s about the same difference as between Stockholm and Rome! The whole february! And March wasn’t better. The “all journey minimum temperature” I measured was only -24 °C, I expected temperatures near -40 °C, at least once. And it was very windy – Norway got its hurricane Ole with average wind speeds up to 36 m/s (that’s level 12 on the Beaufort scale) and gusts up to 53 m/s (that’s level 16 on the extended Beaufort scale!). But many others days were windy and stormy, too, even if not so severe as hurricane Ole. Most trees where free of snow. Either the snow was blown away or it just melted and dropped down. That made not only the pine forests looking quite boring, but also the snow looking quite dirty, since it was covered with leaves, needles, small branches, bark and much more. That didn’t look like the untouched, virgin winter landscape in early February but more like city parks in late April, a minor catastrophe for photographers who want to show impressive winter images. Luckily there were exceptions and I got at least some wintry images with snow covered trees, even if only a few. Yes, it has been cold in January. Some days. In Sweden, but not in coastal Norway where I was at this time. Yes, it snowed ridiculously much in the first days in February, both in the coast and in central Lapland, but not in Abisko in the western mountain region, where I was at this time. It was a bit like being in the wrong place at the wrong time. Later, when Ole arrived, big amounts of snow where forecasted in the mountains, but I considered the weather too dangerous to drive there. As in early February I only saw the results, never the snow fall itself. And then came the warmth. Since the 24th of February I’ve measured temperatures above zero almost every single day. And this effect wasn’t local, it took place in the whole Northern Europe. In Norway, in Sweden, in Finland. Streets were icy, snow was crusty and I was just glad when it didn’t rain. Yes, when it comes to weather I am really disappointed. It was the lousiest winter ever, that I experienced north from the polar circle, where I’ve been travelling round since January 2003 now. Don’t get me wrong! The journey was great, but mostly it was great despite of the weather, not because of the weather. Last winter was quite bad, too, this winter lousy, now I hope, that winter 2016 will be extraordinary cold and snowy and that I’ll find the time to travel around again. Just some final thoughts – quite unordered and far from being complete. Friends – I made the journey alone, but I spent time with friends. In Haukenes on the Vesterålen, in Kurravaara and in Murjek. At Solberget in Swedish Lapland, in Abisko/Björkliden, and finally in Kirkenes near the Norwegian-Russian border. Sharing time, thoughts and experiences with others is always great and I really enjoyed the time I was allowed to spend with old and new friends. Conclusion: Share more time with friends! Each tour gave me the impression of being in the right place and doing it right. I realised again, that I just adore being outdoors, especially in the kalfjäll – the alpine tundra above the tree line. Conclusion: Be outside – it feels good! Driving alone – This journey involved a lot of driving, sometimes the whole day. I consider this both boring and exhausting. Boring because you cannot share your thoughts (see Friends above), exhausting because I had to drive every single of the 6630 kilometres by myself. Sometimes I couldn’t enjoy driving as much as I hoped, I was just glad to arrive somewhere. Conclusion: Take a friend, drive less or just stand it. Tenting and short days – Short days aren’t any problem if you have a cabin or another warm place to stay. They are less fun, when you’re still driving without knowing whether you’ll find a cheap overnight stay. They are hard, when you lie alone in your tent and it’s pitch dark outside already at five o’clock. Again boredom is the main problem (see Friends above, again) and time as well since it may take much time to find a place for tenting, erect the tent, cook your meal, do the dishes and so on. That’s why I tented only once (and slept two other night in my tent too without the need to cook). Conclusion: Take a friend or avoid tenting when days are too short. Abisko and around – an ideal place for starting ski tours between an hour and some weeks. I recommend Abisko Handcraft for accommodation. Mountains – we have some tree-covered hills but no real mountains and no tree line neither – a pity! It’s all right as long as it’s winter! … that was the short term Aurora Forecast of Alaska before the server broke down. I never saw such a high level in a forecast before. Even an hour after sundown the Northern Lights were visible on the blue sky. After a rehearsal with the chamber choir I drove to Harrbäckssand, a small beach near Ursviken. The whole sky was covered with the Aurora, as I never saw it before at home. Unfortunately it was not too bright and faded down while I tried to make some photos. That was my place – “high in the bleachers” this night. After taking some photos I unrolled my camping mat and sleeping bag on the boat bridge and laid down to sleep. I didn’t got much of it with the ice cracking under the boat bridge and the fascinating aurora illuminating the whole sky. Half past three the aurora was still very active, but I decided that it would be nice to continue sleeping in a real bed, where I can twist and turn around. I never saw the Northern Lights in so many variations in a single night. Sometimes there were some small, but very bright Northern Lights in several directions. It looked like a photo exhibition. Sometimes huge green and violet garlands and vortexes covered the sky. Sometimes the whole sky was filled with faint Northern Lights flickering and whizzing around as I never watched it before. Most time lapse videos are lame in comparison. And when I woke up round half past three a bright crystal star of Northern Light gleamed right above me in the zenith sending its beams over the whole sky. Just amazing! These photos are really nothing compared to reality. Yesterday I had a longing to the Arctic. I yearned for being on Greenland, Svalbard or somewhere in Nunavut. Tonight I was comforted a bit – it’s fantastic to be able to see them just round the corner of my home. A great night but now I had to catch some sleep, I’m working tomorrow. Today I would have loved to be either in Longyearbyen on Svalbard or on the Føroyar, the Faroe Islands. Then I could have seen the first total solar eclipse in my life. But at least we had fantastic weather with clear blue sky and I could watch the partial solar eclipse. OK, the eclipse photo first. As a matter of fact it’s a composition of two images. The sun itself, that I photoed with a so called “big stopper” that takes away 99.9% of the visible light. Also a good eye protection, even through the tele lens. But the sky is pitch black on this filtered photo, that’s why I made a shot of the blue sky and merged both images in Photoshop. Even if it’s quite fascinating to watch the solar eclipse I want to mention the surrounding as well: I stood on the thick ice at the rocky shore of the Baltic sea. Water is open, most ice floes are away, but the shore is still covered with thick ice that is underpinned by large rocks. Therefore the ice is hovering above the sea water and the tiny waves created funny-looking icicles underneath the ice. Back to the solar eclipse. I never saw a total solar eclipse in my whole life and I’m really longing to see one. I had checked the next total solar eclipses, to check where I can see one. August 21, 2017 – USA. Come on, what did I say? December 14, 2020 – Southern Chile and Argentina … – Again? What about Europe or Canada or Siberia? December 4, 2021 – Antarctica – I know, it’s hard to find a place on earth that’s even still less way up north, but for Antarctica I’m willing to make an exception. It would be great to see a total solar eclipse in Antarctica. I have to check if there’re any opportunities to travel to Antarctica to see this eclipse. But I guess, it’s coming to be expensive! Are there any rich people out there? Who is willing to sponsor me a trip to Antarctica in December 2021? Or parts of it? Please contact me, I have a warm jacket. If you love to witness the sun rise you have to rise up early. Today I managed to stand up round 4:15 and half an hour later I stood at the sandy beach of Harrbäckssand to see the sun coming up. Well, sandy beach it is in summer, now the shore is covered with snow and ice. And today it was even quite cold with temperatures round -12 °C. This may be the last “real” winter day this season, but you never know, last year it snowed in May. 5:16 the first bright orange beams of the sun appeared behind the island Medgrundet. Minutes later the sun illuminated ice, snow and pine trees with warm colours between orange and pink. I loved the swirly ice patterns on the half frozen water of the shallow beach. After a while I drove home again and took an additional nap. 4:15 is too early, even for me. Yesterday I drove to Kittilä in Finnisch Lapland, because I’ll stay in a cabin in Äkäslompolo for a week with Annika and a friend of hers. Since they planned to take the first morning flight from Helsinki today they will arrive at 7:30. I decided to drive the day before and sleep at the airport. The airport has some short but comfortable-looking couches. However the last flight went at 23:50 and I was already tired at eight o’clock. Therefore I decided to sleep in the car. I was awake in the night twice and quite early in the morning again hearing the snow ploughs shovelling away the two centimetres of snow that fell in the night. I tried to continue to sleep, but the beep-sounds of the backing ploughs kept me awake. 40 minutes left before the plane is going to land. The trip to Äkäslompolo ist not far, just 50 kilometres. I’m longing for the cabin – and some additional day time nap. Since Saturday I’ve been in Äkäslompolo with Annika and Medi, a friend of hers. Äkäslompolo is famous for cross-country skiing and has a total of 330 km of cross-country ski tracks. And that’s what we are here for: Cross-country skiing. My first almost real sport holiday for a zillion years. On Saturday we used the skis only for a shopping trip to the other side of the lake. I gave my old cross-country skis a quite suspicious look, they are so much thinner than my tour skis (not to mention the broad wooden Tegsnäs skis). Will I be able to ski on these sticks or will I fell right onto my nose after five steps? But the shopping trip (no ascents or descents at all) went well. And in the evening even the grey sky cleared up, patches of fog appeared over the snowy terrain and temperature dropped to -10 °C. We took an evening walk and watched the starry night in hope for Northern Lights, but unfortunately they didn’t come out. We continued and headed for Hangaskuru where we planned to take our lunch. And we were well equipped: We didn’t only have sandwiches, but sausages and extendable barbecue forks as well. Yummy! When we headed home more and more skiers were on the ski tracks, it was really crowded and it got worse and worse. “That’s no fun anymore”, I thought but rather like driving on a German autobahn. Hopefully it would be less crowded under the week. Monday. We took the airport bus that left us at Ylläs-Lainion. The track was in inferior condition, since it had started snowed a bit, but we were almost alone and that’s more the way I like being outdoors. With relaxed but steady movements we slid through the wintry Finnish landscape. However we did not hesitate to take short or longer breaks in the cozy little huts. After round about 20 km we were home again. We decided not to make a longer tour, because cross-country skiing on tracks is less fun when the tracks are covered with snow. I took a walk to the supermarket – partly with Annika, partly alone and tried to continue a snowshoe trail, but the trail was only prepared partly and the snow mobile track, that I followed instead a while, headed to the wrong direction. So I had to return the same way. Äkäslompolo is made for cross-country skiers. In the afternoon I took a short circular ski tour. Since yesterday fell 10-12 cm new snow accumulating to at least 100 cm snow on the ground. On the short tour I’ve been in Karilan Navettagalleria, a nice café, that Medi discovered in the morning, but I took only two pictures and continued my tour. We already have planned another tour for tomorrow and included the café in our plans. Now I’m sitting in a cozy couch in a typical Finnish bar. And what’s typical Finnish? Right – Karaoke! The Finns love it and I love listing to all these melancholy melodies. Next time I have to learn some melodies and join the singers, too. They probably will laugh their heads off when I try to sing in Finnish.